While some may go for utility instead of beauty when it comes to living room color ideas, a living room should always represent you. Not just because it’s the first thing people see when they visit you, but also because it’s the room most likely to make a statement in your home. It’s the single place in the house where people will consistently gather to socialize, so it should look its best. Are you in need of living room color ideas for 2018? We have seen hundreds of living rooms that might inspire you. So, here are 15 living room color ideas worth considering. Red has always been a controversial color, especially when it comes to interior design. Many people consider it too aggressive, but it can look impressive when used properly. Instead of smearing your walls with turbulent red, you can temper the overall appearance by opting for coral red or Glowing Firelight. 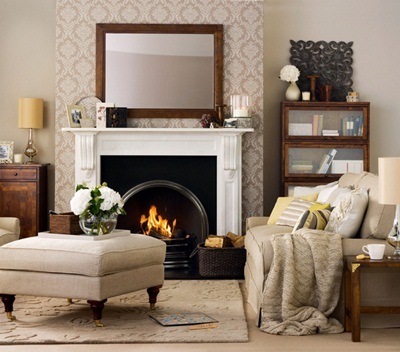 To achieve perfect balance in your living room, you can further temper the red with pops of white. To keep everything in check, add dove white wall accents, white furniture, and colored pillows. If you are searching for sophisticated and classy living room color ideas, you will definitely love this symbol of eclectic elegance. 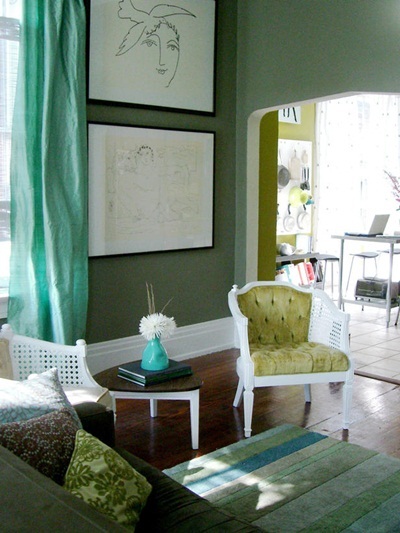 The color palette for the living room in the image above includes shades of jade green, yellow-green, and turquoise. It is not only the walls that you can paint. You can also paint wood pieces in bright white for a little contrast. 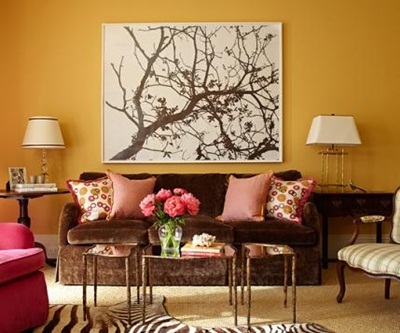 Assort them with similarly colored furniture for a cohesive and sophisticated look. This is how you use popular living room colors. You may think that monochrome rooms can become boring at some point. However, adding an interesting twist to a simple and catchy design can make a world of difference. A unique tone of green or blue, combined with the refined feel of the wood, and white cushions and curtains, can turn a seemingly uninteresting room into your favorite place in the house. These modern color schemes for living room space are worth your while. Are you in need of beautiful living room color ideas? Sometimes, the best solution is to not use color at all. 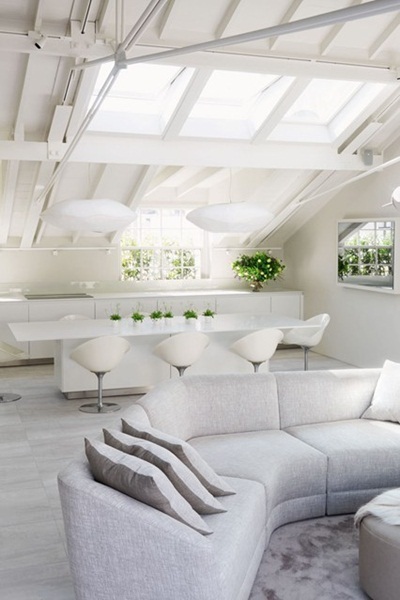 White has always been considered one of the best options for interior design. The reason is that it conveys ultimate sophistication through simplicity. There is no way you can go wrong if you create an all-white space. Sure, you might think you will obtain a dull look, but this can easily be avoided by adding different textures. Additionally, you can throw in a crocheted pillow, a roughhewn linen sofa, a beige rug, or interesting wall decoration to achieve the ultimate monochromatic look. Talking about all-white living rooms, pairing that up with different shades of white furniture could turn up to be the most inspired decision you ever made. Less is more, even in such circumstances. An enormous white couch next to a white bar where the only spots of color are the drinks or the decorative plants can take your living room to the next level. Such designs work especially well in well-lit homes with large amounts of natural light that complement the pastel hues. Do you enjoy earth tones and natural motifs? Then how about these elegant and youthful living room color ideas which combine simple yet tasteful elements? A neutral color for the couch (brown or beige), an interesting coffee table (wireframe with glass elements), and a statement-making piece of art. Adding some personal touches such as lighting, curtains, or a cozy armchair are optional but welcomed. Although you could go for the traditional, vividly colored wall, there are better solutions when it comes to living room color ideas. For example, you can swathe one wall in a cheery wallpaper that will warm up the entire space. Think about the furniture and decorations that you will be using, and chose a pattern that contains all the colors (preferably from the same palette). You could also pick assorted curtains and rugs. The rest of the walls should be painted white or in a neutral tone, to balance out the details. Sometimes, when you can’t decide from the plethora of living room color ideas, it is an even better idea to choose all of them. Seriously, why not go for a multi-colored living room? The one above is a great example. 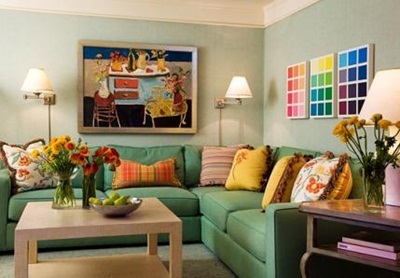 The green sectional sofa is topped with funky colored pillows in shades of apricot, yellow, and orange. At the same time, equally charming folk-art paintings hang on the wall. On the right, we also have a three-panel contemporary series showing shades of colors from three color families. As for the walls, they were painted in a seafoam green. However, you can always go for a different color. 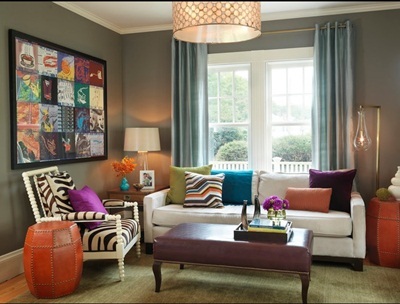 Just make sure you keep it light, and highlight different colors by using painted furniture or bold accessories. 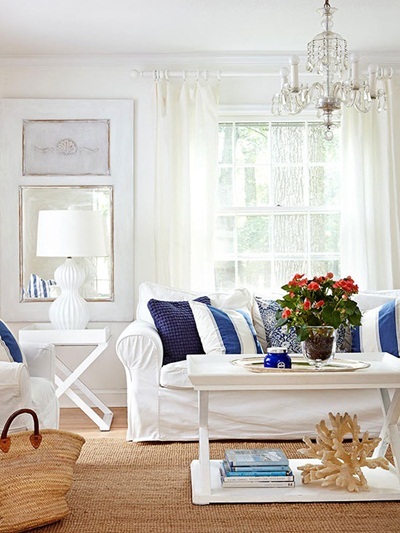 What can you do with an all-white spacious living room? How about the comfiest place to have margaritas with your girlfriends? Envision 4 or 5 beautiful armchairs. Pink is an option, although you can always go for pastels. They are centered around one enormous coffee table or a pouf, the lighting is dim, and there are cushions to spare. Any bachelorette’s dream! Talk about living room wall color ideas! Although it may sound counter-intuitive to paint your entire living room in neutrals, you can make it look amazing with dark-wood flooring and colorful decorations. Incorporate light and dark contrasting details to boost a neutral living room’s appeal. You can take it one step further by adding different tones of the same neutral color to the walls. Start with white or cream painted woodwork, and end with a mud-brown. Hang some chandeliers over the table, and put some light-colored rugs under the coffee table. If there was ever a good color combination for interior design, then it is definitely sandy beige with navy blue and creamy white. It has a slight seaside cling to it, but it is perfect for all types of interiors. 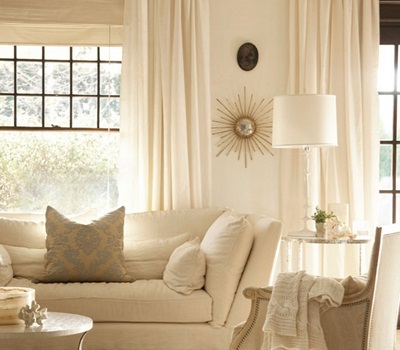 All you have to do is use white furniture, and accessorize it with white and beige walls. 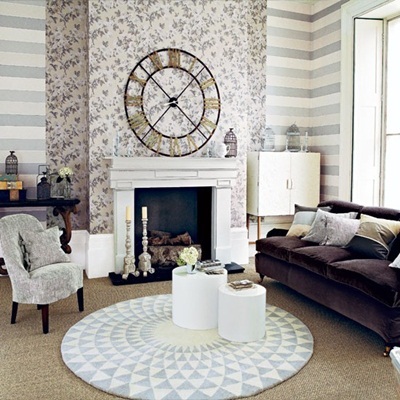 Take it a step further by adding navy blue cushions and decorations, or place a sandy beige rug over the wooden floor. 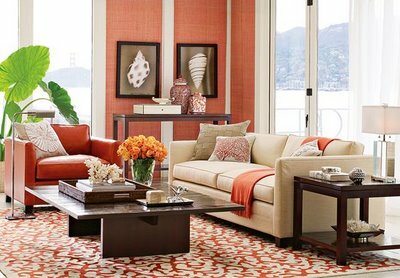 Create a breezy and cheerful backdrop that handily highlights coastal colors and beach-combed treasures by applying one of the best living room color ideas of 2018. Instead of playing by the rules, why not make new ones? Most homeowners shy away from stronger or vibrant colors. However, they can actually instill new life into a boring living room. Start by painting your walls in neutral colors, with an accent of bloody red, blue, or green. Add a multicolored serape rug. 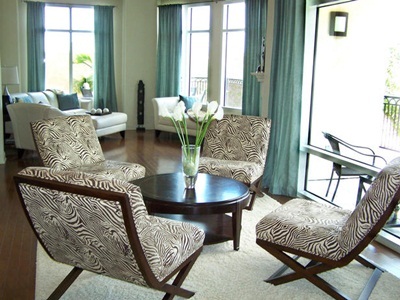 Include comfy chairs covered with chintz and a colored-plaid wing chair to match the set of animal print pillows. 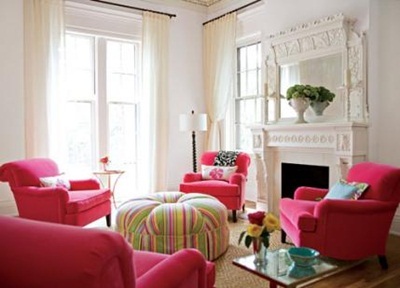 Congratulations, you just created a living room with vibrant colors which will surely shock your visitors. You now have the best living room paint colors in your home! 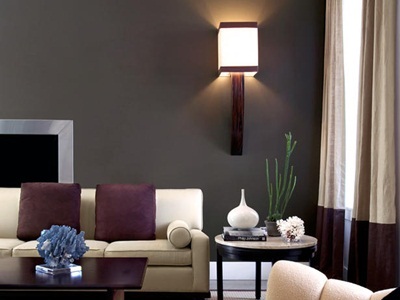 Design a living room that truly makes a statement with the help of rich, saturated shades like dark purple or gray. Be careful, though, because you might obtain a living room that feels too dark. To avoid this, you should opt for cream furnishings and two-toned draperies. Use light colors on the upper par, and darker ones at the bottom. Also, make sure that you use matching color tones and decorations for your living room color ideas. 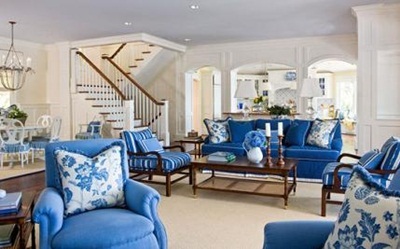 Cool blue draperies and cream walls contrast incredibly well with dark walnut floors and white, patterned furniture. So, what do you have to do to obtain a similar effect? Simple enough. Paint your walls in a light-blue or green color. Add beautiful blue drapes, wood furniture, and elegant decorations. The basic colors you have to work with here are turquoise, teal, and copper. The idea is to create a space where, as you can see from the inspiration examples below the image itself, the sea meets the summer’s golden fields. As far as living room color ideas go, you will also need to balance these strong hues. Therefore, don’t forget to add some accents of non-color, such as white and black. A big, grey couch will work wonders as well, making sure the eye goes immediately to the colorful walls and accessories. 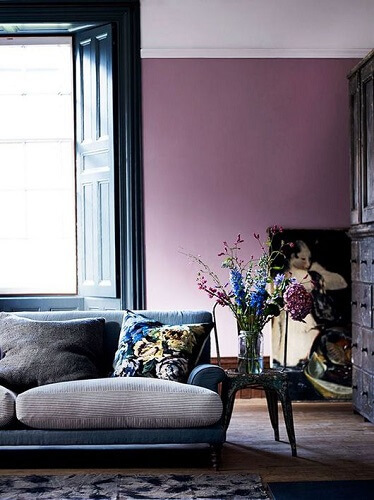 There’s just something about a purple living room. The calmness of it all when you walk in can almost not be described in words. Everything seems to be keeping still and cool in here, elegant and smelling of ripe plums and frosted lavender. Let your imagination run wild on this one, and add as many shades of plum or purple as you want. Use them on the walls, floor, furniture, and decorations. Don’t forget to add a touch of royal blue, as well as some burgundy or wine here and there, to balance things out and make it easy on the eye. With this, we end our round-up for the most inspiring living room color ideas of 2018. Chances are that more trends will emerge in the meantime, but at the moment, these are some of the most popular ones. Nevertheless, as far as interior design goes, there are no rules. Imagination is the limit, and homeowners can always experiment with their rooms. We would like to thank HGTV, BHG, and House & Garden for providing us with much-needed inspiration on our round-up. Do you have a color palette idea that is worth sharing? Feel free to leave your comments below.